Based on our contacts in the brewing world, it’s been pretty evident that the mead industry is growing at a good clip, especially in the last 3 years. Of course, we’re never really sure of the exact data, until now. Based on research and article from the AMMA, we’ve got a great infographic that details some pretty impressive figures. The AMMA has been tracking the mead industry for a while now, but this year, not only did we see phenomenal change, we have this amazing graphic (see below) to show you what happened. We are growing at an amazing rate. Now, on average, a new meadery opens every 3 days! The bulk of the meaderies surveyed, 67%, had been open less than 5 years, so lots of new meaderies. All meaderies surveyed produce at least one mead over 7% ABV, with a growing 30% making ‘session’ mead, under 7% ABV. A large percentage, just under a quarter, are also making cider. Styles were well represented, with 86.8% of meaderies surveyed making melomels, followed by 83% making traditionals, and 73% metheglins. Cysers are next, with 60%. You’ll see carbonated session meads are catching up, with nearly 36%. We expect that number to grow, as session meads are very popular. Best sellers are still melomels at 27%, but traditionals are close behind at 21%, showing that more and better traditionals are always being produced. Session meads are selling in 3rd place, and I wouldn’t be surprised to see that pass traditionals next year. Packaging is at over half bottling in 750 ml bottles, but 375 ml are right behind it at 53%. Cans sit low on the scale, at only 8%, but given how many canned meads we’ve been seeing, look for that to increase next year. At this point, nearly 40% our responding meaderies are generating less than 10% of their sales from their tasting rooms, compared to 44.9% who are generating somewhere between 20 and 100% in the taproom. Half of that number get more than 50% of their sales from their tasting rooms. It’s encouraging to see how many meaderies, 81%, that are sourcing their honey locally! While 70% of the surveyed meaderies reported less than 5 employees, 21% reported 6-10, so it will be interesting to see how this changes next year, as more new meaderies open, and existing meaderies grow. 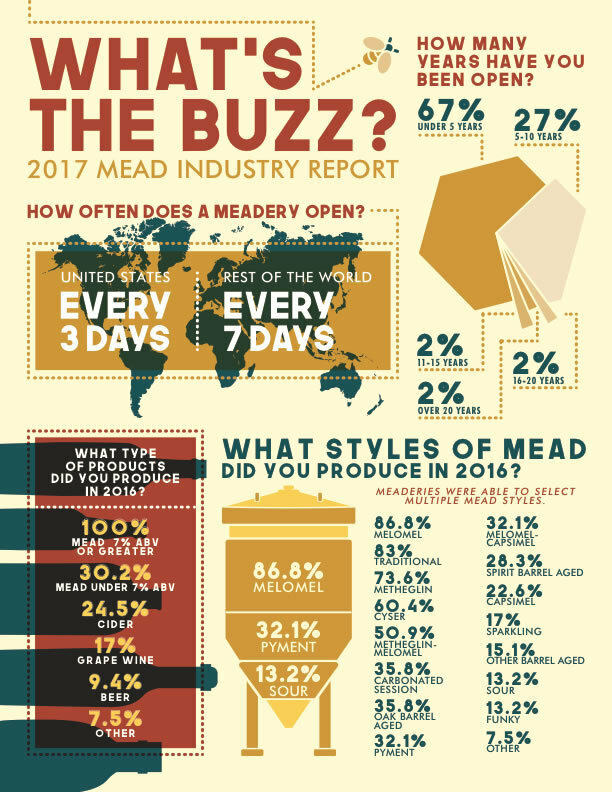 68% of reporting meaderies make less than 10 styles, but we’re seeing nearly 32% making a broader spread of meads.